The Tuvalu Meteorological Service (TMS) is the principal meteorological observatory of Tuvalu and is responsible for providing weather services to the islands of Tuvalu. A meteorological office was established on Funafuti at the time the islands of Tuvalu were administered as parts of the Gilbert and Ellice Islands colony of the United Kingdom. The meteorological office is now an agency of the government of Tuvalu. The main observational office is on Funafuti. TMS operates outstations on Nanumea, Nui and Niulakita. TMS operates or monitors: 4 synoptic stations; 5 rainfall stations; 1 upper air research program; 1 tide gauge with Tsunami warning system; 1 Continuous Global Positioning System (CGPS) station; 1 seismic station. The TMS publishes weather forecasts, warnings as to tropical cyclones, weather charts and weather satellite images on its website, with weather forecasts and storm warnings also broadcast by the Tuvalu Media Corporation, which operates Radio Tuvalu. The meteorological office on Funafuti was established in 1951 under the auspices of the South Pacific Air Transport Council (SPATC). An upper air observation programme was established in 1960. After the dissolution of SPATC in 1979, the Meteorological Service of New Zealand Limited supported the upper air programme until the TMS assumed responsibility for the programme, with continuing support by the New Zealand Ministry of Foreign Affairs and Trade (MFAT)/NZAID. The TMS works with the New Zealand MetService, the Fiji Meteorological Service, the Australian Bureau of Meteorology, Geoscience Australia, the United States Geological Survey and the National Weather Service. Ms Hilai Vavae retired as Director of the Tuvalu Met Service in 2014. The Pacific (inter-)decadal oscillation is a climate switch phenomenon that results in changes from periods of La Niña to periods of El Niño. This has an effect on sea levels. For example, in 2000 there was a switch from periods of downward pressure of El Niño on sea levels to an upward pressure of La Niña on sea levels, which upward pressure causes more frequent and higher high tide levels. The Perigean spring tide (often called a king tide) can result in seawater flooding low-lying areas of the islands of Tuvalu. The TMS operates 2 meteorological programmes (surface observation programme and upper air programme) and hosts other climatological research projects. The TMS carries out ground level observations of various weather elements. This data is shared with collaborating partners in the World Meteorological Organization - World Weather Watch (WWW), the Global Climate Observing System (GCOS) and the Global Earth Observation System of Systems (GEOSS). The upper air observation programme in Funafuti makes radiosonde observations to collect upper air weather for weather forecasting and research. The radiosonde observations use a small, expendable instrument package is suspended below a 2 metres (6.6 ft) wide balloon filled with hydrogen or helium. As the radiosonde rises at about 300 meters/minute (1,000 ft/min), sensors on the radiosonde measure profiles of pressure, temperature, and relative humidity. These sensors are linked to a battery-powered radio transmitter that sends the sensor measurements to a ground receiver. By tracking the position of the radiosonde in flight, information on wind speed and direction are also obtained. The data is shared with Regional Specialized Meteorological Centers (RSMCs) in Nadi, Wellington, Brisbane, Melbourne and Honolulu. The weather modelling carried out by the RSMCs enables more accurate forecasts to be prepared for Tuvalu and for the tropical western Pacific. The meteorological observations of the TMS are shared with other regional agencies that attempt to predict how many tropical cyclones and severe tropical cyclones will develop within the Southern Pacific. New Zealand's National Institute of Water & Atmospheric Research (NIWA) and collaborating agencies including the Meteorological Service of New Zealand and Pacific Island National Meteorological Services (including the TMS) issue the "Island Climate Update Tropical Cyclone Outlook" for the Pacific. This forecast attempts to predict how many tropical cyclones and severe tropical cyclones will develop within the Southern Pacific between 135°E and 120°W as well as how many will affect a particular island nation. The Fiji Meteorological Service, while collaborating with NIWA and partners, also publishes its own seasonal forecast for the South Pacific basin between 160°E and 120°W. The data collected by the regional meteorological agencies is provided to the World Meteorological Organisation, which publishes current tropical cyclone information for the South-West Pacific Ocean. The tide gauge, which was installed in 1978 by the University of Hawaii. The SEAFRAME tide gauge, which is modern Aquatrak acoustic gauge installed in 1993 by the Australian National Tidal Facility (NTF) as part of the AusAID-sponsored South Pacific Sea Level and Climate Monitoring Project. South Pacific Sea Level and Climate Monitoring Project (SPSLCMP): which was developed in 1991 as an Australian Government response to “concerns raised by member countries of the South Pacific Forum over the potential impacts of human-induced global warming on climate and sea levels in the Pacific”. This project is conducted in conjunction with Geoscience Australia (GA), which installed a Continuous Global Positioning System (CGPS) station at the TMS office. Climate and Ocean Monitoring and Prediction (COMP) project: established by Australian Bureau of Meteorology as part of the Pacific Islands Climate Prediction Project (PI-CPP). Seasonal Climate Outlooks in Pacific Island Countries (SCOPIC) project: established by Australian Bureau of Meteorology, which is a “decision support system for generating probabilistic predictions (seasonal climate outlooks) for rainfall, temperature or other climate related parameters”. The World Meteorological Organization (WMO). The Secretariat of the Pacific Regional Environment Programme (SPREP). SOPAC / SPREP / WMO sponsored meetings of Regional Meteorological Service Directors and Regional Disaster Managers. The Pacific Meteorological Council (PMC): is a specialized subsidiary body of SPREP, established in July 2011 at the 14th Regional Meteorological Services Directors meeting in Majuro, Marshall Islands on a bi-annual basis to facilitate and coordinate the scientific and technical programme and activities of the Regional Meteorological Services. The Online Climate Outlook Forum (OCOF): also known as the Pacific Islands online Climate Outlook Forum (PICOF) that is a monthly discussion among Pacific Island National Meteorological Services (NMS) and the Australian Bureau of Meteorology. The OCOF assists in the implementation of the SCOPIC project and the Climate Adaptation Projects that are supported by the Australian Bureau of Meteorology. ^ a b c Katea, Tauala (6 April 2007). "Strategic Planning of Tuvalu Meteorological Service 2007 – 2011" (PDF). Retrieved 18 April 2014. ^ Malaki, Semi (6 June 2015). "El Nino is back in town and may stay longer". Fenui News. Retrieved 14 June 2015. ^ Katea, Tauala (25 June 2008). "Funafuti Meteorological Observatory" (PDF). Retrieved 18 April 2014. ^ North, Rosemarie (20 May 2015). "Fusing tradition and technology to protect communities in Tuvalu". The International Federation of Red Cross and Red Crescent Societies (IFRC). Retrieved 21 May 2015. ^ a b c d e f "Current Warnings: Tuvalu". Fiji Meteorological Organisation: RSMC-Nadi-Tropical Cyclone Centre. Retrieved 12 March 2017. 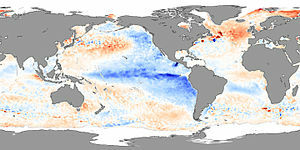 ^ "El Niño/Southern Oscillation (ENSO) Diagnostic Discussion - NOAA Center for Weather and Climate Prediction (U.S. National Weather Service)". Tuvalu Meteorological Service. Retrieved 18 April 2014. ^ Malaki, Semi (9 March 2015). "Three women to contest for the General Election" (PDF). Fenui News. Retrieved 12 June 2015. ^ "Climate Change in the Pacific: Scientific Assessment and New Research". Pacific Climate Change Science Program (Australian Government). November 2011. Archived from the original on 12 March 2011. Retrieved 19 April 2014. ^ "World Meteorological Organization". Retrieved 18 April 2014. ^ "Global Climate Observing System (GCOS)". National Oceanic and Atmospheric Administration (NOAA). Retrieved 12 March 2017. ^ "National Institute of Water and Atmospheric Research Ltd". NIWA. Retrieved 12 March 2017. ^ "Current Tropical Cyclone Information: South-West Pacific Ocean". World Meteorological Organisation: Severe Weather Information Centre. Retrieved 12 March 2017. ^ Hunter, John R. (2002). "A Note on Relative Sea Level Change at Funafuti, Tuvalu" (PDF). Antarctic Cooperative Research Centre. Archived from the original (PDF) on 7 October 2011. Retrieved 13 October 2011. ^ "SPSLCMP: South Pacific Sea Level and Climate Monitoring Project". Australian Bureau of Meteorology. Retrieved 18 April 2014. ^ Lal, Andrick. "SOPAC Trip Report 346: CGPS Maintenance Survey Visit – Tuvalu (South Pacific Sea Level & Climate Monitoring Project Phase III)" (PDF). South Pacific Applied Geoscience Commission. Retrieved 18 April 2014. ^ a b "Climate and Ocean Monitoring and Prediction". Australian Bureau of Meteorology. Retrieved 18 April 2014. ^ "SCOPIC: Seasonal Climate Outlooks in Pacific Island Countries". Australian Bureau of Meteorology. Retrieved 18 April 2014. ^ "Pacific Meteorological Council". Retrieved 18 April 2014. This page was last edited on 12 July 2018, at 00:46 (UTC).